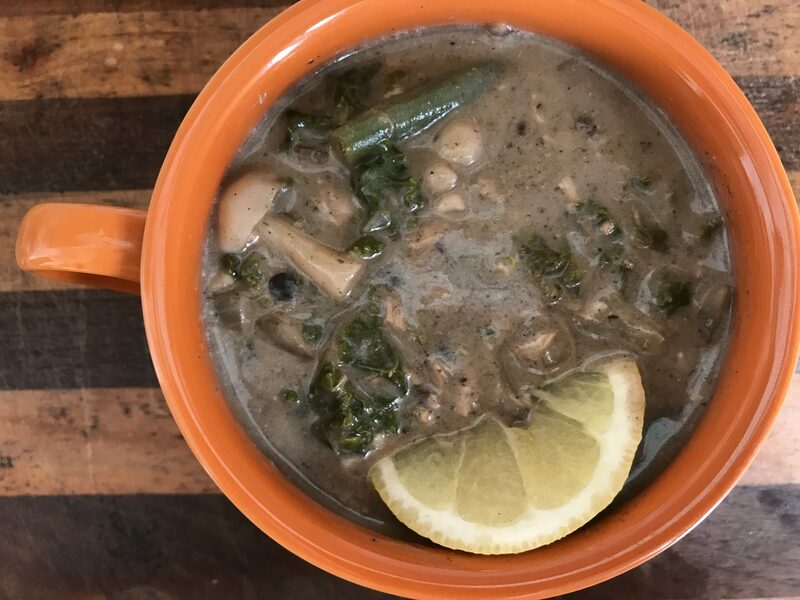 I love soup and I love to make it … and this is probably one of my favorites. Why? It’s easily adaptable (use whatever fresh vegetables you like or have handy), it’s super fast and easy to make, and it’s delicious! The heartiness of the vegetables, the creaminess of the mushroom base, the tenderness of the smoked fish and the lemony zest at the end all marry perfectly together. First, let’s talk tuna. 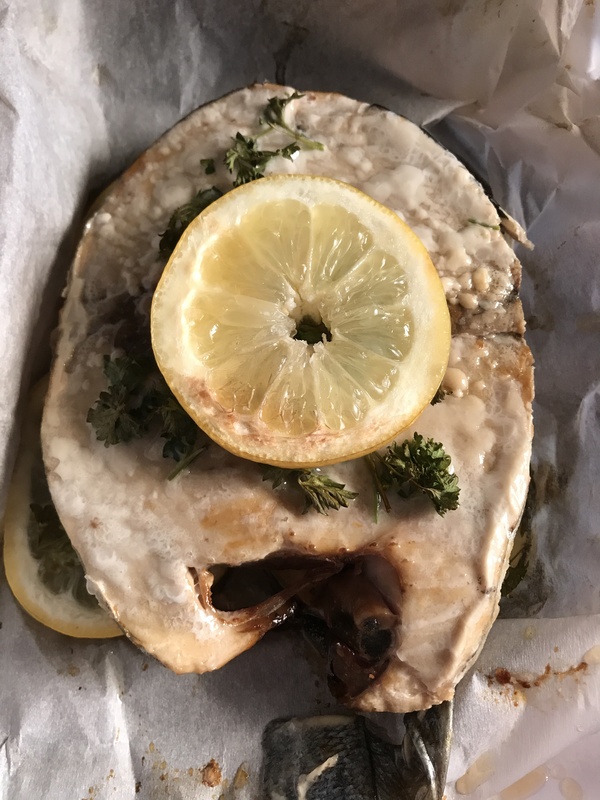 You can certainly grill or bake it, but if you have a smoker (or any way to quickly smoke a piece of fish – like this from Alton Brown), the flavor and tenderness you get from smoking the fish is incomparable. I also recommend if you can to start with a tuna steak like this one, complete with skin and bones. They are very easily removed after the fish is smoked, and they keep the fish from drying out during the cooking/smoking process. I smoked a few tuna steaks this weekend, and I saved an extra one for this recipe. Feel free to substitute any white and flaky fish. The skin comes off instantly; and I usually (put on some gloves and) flake the fish by hand to make sure there aren’t any bones when I add it to the soup pot. Next, the vegetables. 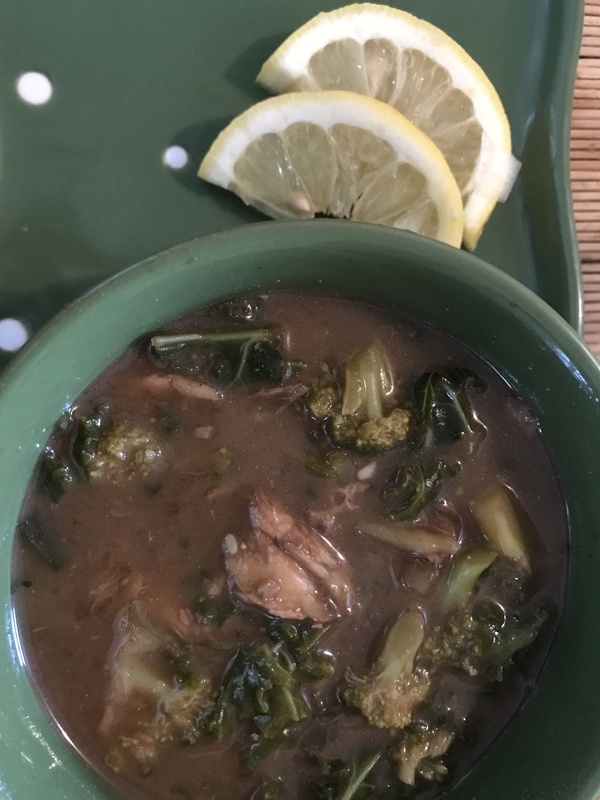 I used kale and green beans for this recipe, then another time I used kale and broccoli. Feel free to substitute any fresh vegetable you like. I think the kale gives the otherwise creamy and soft soup a nice fibery crunch, and I love fresh green beans and broccoli. But use whatever you have on hand or whatever is fresh. What you shouldn’t adapt is the mushrooms and the cream of mushroom soup, which gives it this awesome creamy texture — and of course, the smoked fish. salt and pepper(*see notes above)Chop the onion and put it in a soup pot with the garlic and olive oil. Sautee until the onion is translucent. Add the vegetable stock and the rest of the fresh vegetables, bring to a boil. Let boil for 3-5 minutes, then add the cream of mushroom soup and milk. 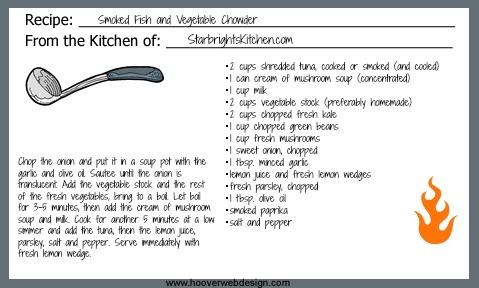 Cook for another 5 minutes at a low simmer and add the tuna, then the lemon juice, parsley, salt and pepper. Serve immediately with fresh lemon wedge.